With plaid fabrics there comes the additional factor of whether or not your plaid has a dominant stripe and how that can affect the outcome of the garment you are planning. Before we jump into this concept, let's review really quick about what we've covered so far. We know that plaid fabrics can be balanced (even) or unbalanced (uneven) - this, by the way, refers to whether or not the stripes make up perfect squares. You can utilize the fabric test that I showed in my last video to determine whether or not your plaid is balanced or unbalanced. This plays a role in the planning of the garment. Balanced plaids will match up easier both vertically and horizontally. Unbalanced plaids will match up either vertically or horizontally, but not necessarily both. Additionally, balanced plaids can be put either on the bias or on the straight of grain whereas often times with unbalanced plaids, the bias creates a weird effect with the plaid itself not being able to produce perfect chevrons. This of course, does not mean that you can't break any of these rules or ideas, they are just keypoints to keep in mind as you plan. Now onto how to find the dominant stripe. 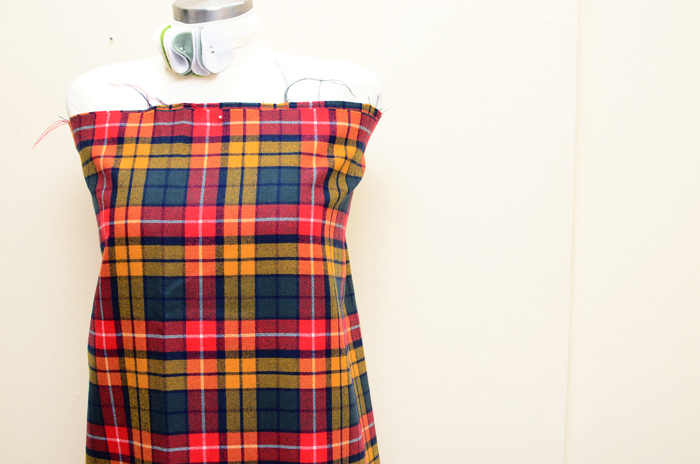 This can be easy and tricky, again, depending on the plaid fabric you are using. First of all, how do you find the dominant stripe? Fold out your fabric so that you can view a wide area of it and then take a step back. Some say that if you squint at the fabric when you look at it from a distance the dominant stripe will jump out at you. Usually I can see it without squinting, but if that helps you, definitely do it. Let's take a look at a plaid that would have an easily identifiable dominant stripe. The tartan above is pretty easy to identify. Its that white stripe. Kind of crazy how that thin white stripe is the one that jumps out at you first, but its true. That red stripe makes a close second, but still its the white stripe that takes the cake. Now what about a plaid that has a harder to identify dominant stripe? 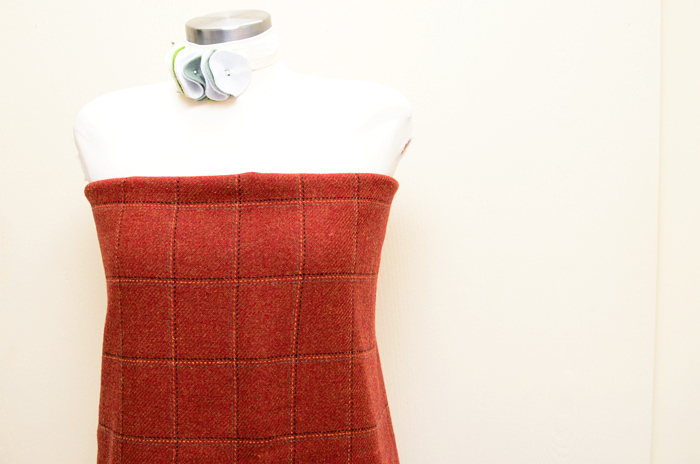 Let's go back to my recent plaid jacket fabric. This plaid is very interesting because I see both the red and yellow stripes as the dominant. The red has the added white stripe running through it and if you know anything about weaving, you'll know that you have to be careful with yellow because it shows up really well in whatever you use it in. So in this instance, I decided to use both stripes as one dominant stripe. Now what about in the example of this windowpane plaid? Does this fabric have a dominant stripe? Technically, those white windowpanes are the dominant, yet the scale and proportion of this plaid makes it so that it really doesn't matter. You'll definitely see what I mean in the coming lessons, but in this instance the planning of the garment would be based solely on matching the plaids and not on where the plaids are positioned on the body. The fabric I've chosen to use for my next plaid jacket is also a windowpane plaid. Does it have a dominant stripe or does it matter that it does? I've decided that though the windowpane is dominant and since its a larger windowpane, I'll worry about the placement of the stripes, but not to the same extent that I did on my previous jacket make. Knowing whether your plaid is balanced or unbalanced and what the dominant stripe is, if there is one will definitely affect how you plan the plaid which I'll go over in upcoming installments of the Plaid Jacket Chronicles. Hopefully this gives you more clarification, rather than confuses the living daylights out of you. 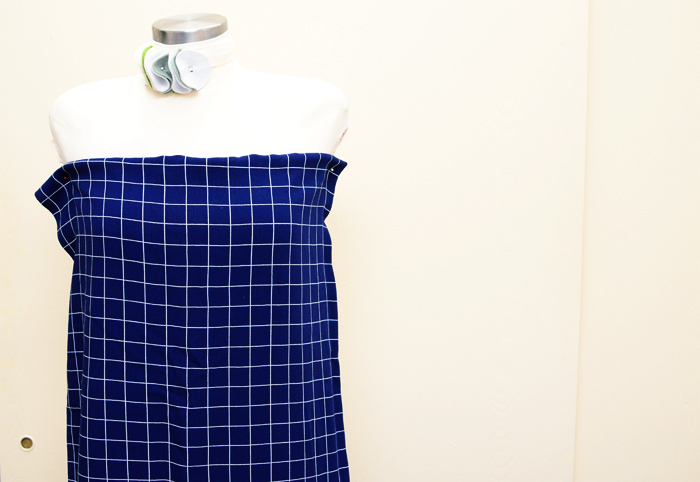 These principles aren't really hard to understand, but stacked up against other plaids you'll find the world of sewing plaids a little more complex than it may appear. Just focus on your plaid and apply what I've gone over here to your fabric. 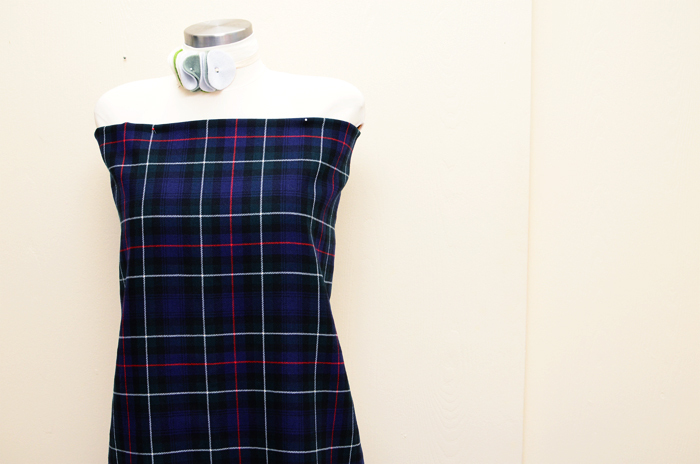 What do you all think about plaid fabrics so far? I think if you just focus on one at a time, you start feeling a little more comfortable with these tricky fabrics. There is so much variety though! Even just doing my own research for these little episodes (or should I say webisodes?) was crazy interesting and kind of.... vast. Lots and lots of plaids out there. Now see, I would have said that in the first one the red is the dominant stripe. But maybe I'm thinking about it in terms of centring the fabric. All those unbalanced plaids really complicate things for me! The reason I don't wear plaid is a reason you pointed out earlier- mismatched pattern points. It hurts my eyes. So I had to giggle when I received the latest JoAnn's sales flyer (on the east coast) and it has a model with a purple plaid dress on the cover... that is mismatched! Oh, the horrors! I feel like this is a silly question, but can you be wrong about the dominant stripe? @Julie at Home on 129 Acres - I think you totally have a point, and I think you could get away with using the red as the dominant. I saw more white and so picked that one straight away, but I do think this one could go either way. Also, crazy enough - the first one is a balanced plaid! You seriously cannot tell just by looking at it, but it is, the test proves it! @Ally - I think you might have a differing opinion on what the dominant plaid is instead of saying which one is wrong or right. For example, I've been teaching a class on this very subject and find it interesting to point out that many times the students and I see different stripes as the dominant. The one I made my jacket out of, 2nd photo down, was one that I felt for sure the red and white stripe was the dominant, but when another student pointed out that she felt like the yellow was the dominant, I started to rethink this plaid. In the end I picked both as they were right next to each other and you could technically use both of them as a stripe together. Sometimes its so much trickier though. When you have more than two colors in a plaid, it might be a good idea to get someone else's opinion on what they think the dominant stripe is. Hopefully this makes sense! Picking the dominant stripe is tricky and sometimes there appears to be more than one stripe that could be used as the dominant. Your plaid jacket fabric is a good example, because I looked at it and to me the wider black stripe could be considered the dominant. It is also symmetrical or balanced. What about plaids that have different dominants going lengthwise vs. crosswise? I see this quite frequently in cotton shirting plaids. I haven't seen the new JoAnn's flyer yet. Living in Alaska means that we usually don't see it until the first day of the sale cycle or later. But I will look at the plaid dress. If you have a different plaid going lengthwise vs. crosswise, you definitely have to decide the dominant for both and use that as your guide to create your garment. In the upcoming lessons, hopefully you'll see some clarity on how to go about doing this. Thanks for doing this series, I'm intrigued now about giving this a go. As for the JoAnn flyer, I haven't seen it but I'm not surprised. My friend and I were just saying last night how we/this generation seems to be losing all the good "tailoring" techniques that were second nature not too long ago - that make garment construction truly beautiful. So keep it coming Sunni! !